Siliguri, 07 September: A self-styled militant outfit, Gorkhaland Liberation Army (GLA) has claimed responsibility for the series of bomb blasts in Darjeeling Hills since 19 August and, has warned Hills based political leaders of dire consequences if they settle for anything less than a separate Gorkhaland state. This comes on a day Gorkha Janmukti Morcha chief Bimal Gurung issuing a fresh audio message wherein he has referred to Binay Tamang and Anit Thapa as Mir Jafar and has asked the people of the Hills to be watchful of traitors like them. 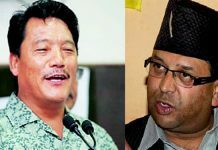 Gurung had yesterday urged Tamang and Thapa to return to the party by amending their mistakes, but the plea met with a negative response from the two. A hand-scribbled Nepali poster in the name of GLA came up in Mirik town today morning, through which the militant outfit has made the revelations. 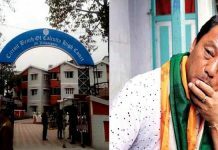 As many as eight bomb blasts have taken place in different parts of Darjeeling Hills so far, killing a civic volunteer and injuring two policemen. GLA is believed to be an offshoot of the now disbanded United Gorkha Revolutionary Front and United Gorkha Revolutionary Army that was founded in Kalimpong in 2004 and 2006, respectively, by Ajay Dahal, a former personnel of the Central Industrial Security Force. 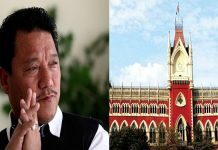 Members of GJM’s volunteer wing, Gorkhaland Personnel (GLP), are believed to be associated with GLA and some of them even received arms training from Nagaland’s NSCN (Khaplang) to wage an insurgent movement for Gorkhaland, Bengal CID told Darjeeling court earlier this year. In August 2014, Assam police had arrested from Chirang district Umesh Kami and Ganesh Chhetri, alleged GLP members, with a cache of arms, including rifles, pistols, and ammunition of AK-series rifles. Bengal CID on 6 December 2014 had found a rifle, 22 rounds of live ammunition and five leaflets of Gorkhaland Liberation Army from an abandoned building in 27th Mile in Darjeeling. Sanjay Thulung, a former elected member of the semi-autonomous Gorkhaland Territorial Administration, is accused of having funded the arms purchase and also allegedly got 15 GLP cadres trained in firearms use from NSCN.